Materials pulled to fulfill patron holds. The Chicago Public Library opened four new locations in 2011: Greater Grand Crossing (4/23/11); Dunning (5/6/11); Daley, Richard M.-W Humboldt (7/8/11) and Little Village (10/3/11). Edgewater closed 6/16/11 for construction of a new branch; a bookmobile for holds pickup and returns opened 6/24/11. Altgeld closed for extended periods in July and August for air conditioning installation. Back of the Yards closed permanently 8/22/11 due to repeated flooding. All locations were closed February 2-February 3 due to weather. In addition, many locations experienced sporadic closures in summer 2011 due to weather-related issues. Patrons may place holds on desired materials either online or by contacting any CPL location. The Chicago Public Library opened four new locations in 2011: Greater Grand Crossing (4/23/11); Dunning (5/6/11); Daley, Richard M.-W Humboldt (7/8/11) and Little Village (10/3/11). Edgewater closed 6/16/11 for construction of a new branch; a bookmobile for holds pickup and returns opened 6/24/11. Altgeld closed for extended periods in July and August for air conditioning installation. Back of the Yards closed permanently 8/22/11 due to repeated flooding. All locations were closed February 2-February 3 due to weather. In addition, many locations experienced sporadic closures in summer 2011 due to weather-related issues. Materials pulled to fulfill patron holds. In January all branch locations were closed on Monday, January 9, Monday, January 23 and Monday, January 30. Beginning in February, all branch locations restored partial Monday hours, from 2 p.m. to 6 p.m. On June 18, all branch locations restored full Monday hours. Edgewater closed 6/16/11 for construction of a new branch scheduled to open in mid-2013. The library’s bookmobile opened 6/24/11 for Edgewater holds pickup and returns. Douglass closed for 10 days in February for roof repairs. Humboldt Park closed 3/26/12 for facility improvements and expansion. Lincoln Park closed for four days in August for replacement of the air conditioning system. Many locations experienced sporadic closures in summer 2012 due to air conditioning issues and area power outages. Albany Park closed 9/22/12 for construction of a new branch and will remain closed until 2014. Brighton Park, Jefferson Park and Portage Cragin were closed 11/26/12-12/7/12 for replacement of their HVAC systems. Patrons may place holds on desired materials either online or by contacting any CPL location. In January all branch locations were closed on Monday, January 9, Monday, January 23 and Monday, January 30. Beginning in February, all branch locations restored partial Monday hours, from 2 p.m. to 6 p.m. On June 18, all branch locations restored full Monday hours. Edgewater closed 6/16/11 for construction of a new branch scheduled to open in mid-2013. The library’s bookmobile opened 6/24/11 for Edgewater holds pickup and returns. Douglass closed for 10 days in February for roof repairs. Humboldt Park closed 3/26/12 for facility improvements and expansion. Lincoln Park closed for four days in August for replacement of the air conditioning system. Many locations experienced sporadic closures in summer 2012 due to air conditioning issues and area power outages. Albany Park closed 9/22/12 for construction of a new branch and will remain closed until 2014. Brighton Park, Jefferson Park and Portage Cragin were closed 11/26/12-12/7/12 for replacement of their HVAC systems. Materials pulled to fulfill patron holds. The Chicago Public Library consists of the Harold Washington Library Center, Sulzer and Woodson regional libraries and over 70 neighborhood branches. Edgewater Branch reopened in a new, 2-story facility on 6/22/2013. Humboldt Park Branch closed 3/26/2012 for construction of a 5,000-square-foot addition; it reopened 2/9/2013. Albany Park Branch closed 9/22/2012 for construction of a new branch expected to open in 2014. Interim services are being provided in the Albany Park community. Gage Park Branch closed 2/22/2013-3/1/2013 for full carpet replacement and South Shore Branch was closed from 5/13/2013-6/29/2013 for repairs and renovation. Many locations experience sporadic emergency closures due to heating or air conditioning issues, or area power outages. Patrons may place holds on desired materials either online or by contacting any CPL location. The Chicago Public Library consists of the Harold Washington Library Center, Sulzer and Woodson regional libraries and over 70 neighborhood branches. Edgewater Branch reopened in a new, 2-story facility on 6/22/2013. Humboldt Park Branch closed 3/26/2012 for construction of a 5,000-square-foot addition; it reopened 2/9/2013. Albany Park Branch closed 9/22/2012 for construction of a new branch expected to open in 2014. Interim services are being provided in the Albany Park community. Gage Park Branch closed 2/22/2013-3/1/2013 for full carpet replacement and South Shore Branch was closed from 5/13/2013-6/29/2013 for repairs and renovation. Many locations experience sporadic emergency closures due to heating or air conditioning issues, or area power outages. Materials pulled to fulfill patron holds. The Chicago Public Library consists of the Harold Washington Library Center, Sulzer and Woodson regional libraries and over 75 neighborhood branches. Albany Park Branch closed 9/22/2012 for construction of a new branch expected to open in Fall 2014. Interim services had been provided in the Albany Park community. Many locations experience sporadic emergency closures due to heating or air conditioning issues, or area power outages. Patrons may place holds on desired materials either online or by contacting any CPL location. The Chicago Public Library consists of the Harold Washington Library Center, Sulzer and Woodson regional libraries and over 75 neighborhood branches. Albany Park Branch closed 9/22/2012 for construction of a new branch expected to open in Fall 2014. 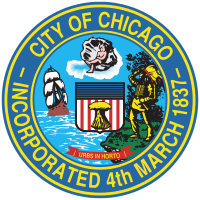 Interim services had been provided in the Albany Park community. Many locations experience sporadic emergency closures due to heating or air conditioning issues, or area power outages.